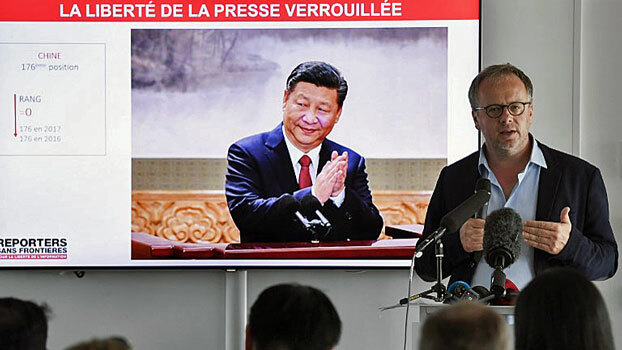 China remains the world’s biggest jailer of journalists with 60 currently behind bars, the majority of whom are citizen reporters who operated outside the ruling Chinese Communist Party’s strictly regulated state media, a Paris-based media watchdog reported. Christophe Deloire (R), general secretary of Reporters Without Borders, speaks at a press conference to present the watchdog’s World Press Freedom Index for 2018, in Paris, April 25, 2018. Of the 60 journalists in prison or detention, 46 are “non-professional journalists who have tried to compensate for the Communist Party’s increasingly tight control on the traditional media,” Reporters Without Borders (RSF) said in an annual report on Wednesday. The report said non-professional journalists are often held in “inhuman” conditions simply for posting something to social media. It said China and other authoritarian regimes including Egypt, Iran and Saudi Arabia have adopted “cyber-laws” in recent years, making it easier for them to target people who post information that isn’t officially sanctioned online. Li Datong, former editor of Freezing Point, a cutting-edge news supplement to the prestigious China Youth Dailynewspaper that was shut down after a purge at the paper, said China has no press freedom to speak of. “The Chinese government’s control over people’s lives is being taken to extremes,” Chang said. Analysts say media controls in China are no longer limited to a list of topics deemed “sensitive” by the government, but are morphing into a nationwide monitoring and censorship system targeting individual thoughts and actions. The nationwide “Sharp Eyes” platform will be able to link up public surveillance cameras and those installed in smart devices in the home, to a nationwide network for viewing in real time by anyone who is given access.